Do you like seeing what is going on with your system at all times? Wondering why your Chromebook with Ubuntu is running slow? Then you need Conky! How to install Conky with harshit1990’s Infinity theme on a Chromebook dual booted with Ubuntu Unity Desktop Environment. Hop over to your Ubuntu Unity Desktop and download the file above and unzip it to the downloads folder should look like this. Once it is done you will need to copy the files that you downloaded above into place. The lua folder and all of its contents will need to be moved to the top home directory and hidden. This can be done using the following command in the same terminal window from above. Now you need to copy all of the config files into place. This can be done using the following command. Once this is done you are good to go. Now all you have to do is start conky. This can be done with the following command. Additionally if you would like to add Conky to the applications that start when the computer starts up then do the following. Once open you should see this window minus Conky from the list. Mine was already done. Click “Add” and close all open windows. 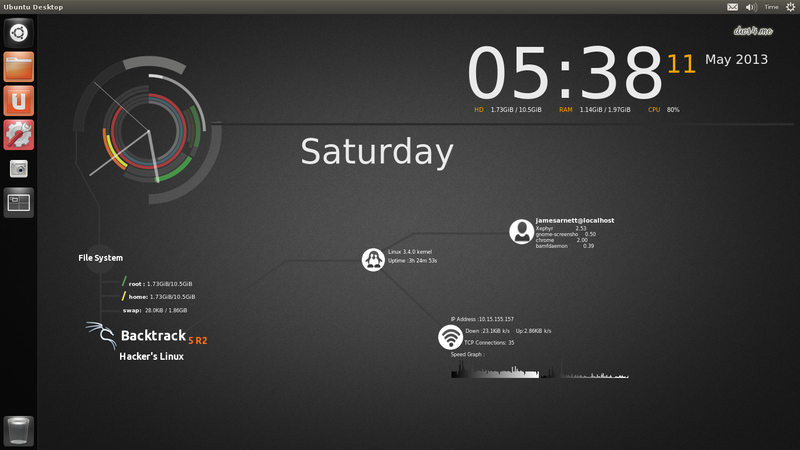 Your Conky is now configured and running. Please let me know if you have any problems or concerns down in the comment section down below. I have been messing around with Conky for about 3 weeks now and have run into any number of problems that I have since fixed. Here is a screenshot of the finished product. This entry was posted in ARM Chromebook, Chromebook, Chromebook and Linux, Conky, How To's and tagged Advanced Packaging Tool, ARM architecture, chromebook, Computer file, Conky, guide, Home directory, how to, infinity, tar, theme, themes, Ubuntu, Unity, Xfce by James Arnett. Bookmark the permalink.